AWI is pleased to introduce you to Chrisann Hessing, the director of the short documentary ‘Turning Tables‘ about emerging Canadian PowWow Techno music producer and dancer Classic Roots! Chrisann’s film has been described as redefining the power of Indigenous voice post Canada-150. Not only does the film share a powerful story of resilience, passion and faith, it has also created space for young people to learn about art and encourage them to pursue their dreams. AWI: Can you tell me a bit about your filmmaking background? When did you start experimenting with the medium and what were the first steps you took in learning about filmmaking and/or diving into the field? Chrisann: Growing up, I always had a fascination with movies and their ability to completely transport viewers to other places. I studied film in college and after working with a production company for a few years, I decided I wanted to travel and continue working in film. This led me to Ecuador and Spain on two separate occasions, where I made short documentaries working with community-based organizations. I fell in love with the craft of documentary and its power to strengthen human connection and create empathy. And while I learned very quickly of the relentless demands and barriers that documentarians face, I felt empowered and humbled by the transformative nature of the medium – not just in the lives of my subjects, but in my own as well. AWI: How did the Turning Tables doc come about? C: In 2015, I had the opportunity to work on a multimedia dance film titled I Lost My Talk, inspired by the poem by acclaimed Mi’kmaw elder and poet Rita Joe. Learning about the origins of the poem and what it represented was eye-opening for me. It was an experience that allowed me to understand history in a way that I never could from a textbook in school, and made me aware of the real privilege we have to occupy these lands. It was also my first foray into performing arts territory, and where I became fascinated by the possibilities of creative expression through music and dance. C: It was during that production where I met Classic Roots, who was working on a new sound, which he called “Pow Wow Techno.” Soon after, I saw him perform live, first spinning on the decks as a DJ, and then later on, spinning on the dance floor decked out in traditional Fancy Dance regalia. 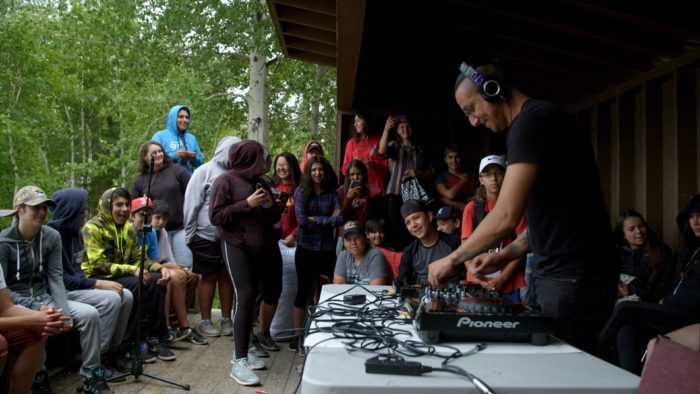 With A Tribe Called Red paving the way for Indigenous Electronica, it was amazing to see Roots take it to the next level – not only integrating Indigenous sounds into techno and house music, but also combining traditional and contemporary dance. The whole performance was so invigorating and breathtaking that I was compelled to create a film about Roots and his work. We gratefully received funding from BravoFactual and completed the short documentary in 2018. AWI: With the doc being well received at HotDocs, have there been any particularly moving stories shared as a result? What has been the biggest shift you’ve seen as a result of your film? C: The best thing to come out of our festival screenings were the discussions that followed, on representation in media and the influence of positive role models. We’ve been a part of conversations between Indigenous and non-Indigenous people interested in learning more about the culture and uplifting each other. We’ve connected deeply with people who felt encouraged to continue on their own healing journey. We’ve listened to elders and educators speak about how important it is for Indigenous youth to see themselves represented on screen and through a positive role model. And above all, we’ve witnessed our young audiences become excited and empowered to share their own stories and follow their dreams! AWI: Can you speak to where you envision the film going as it relates to film screenings and workshops with Indigenous and non-Indigenous communities, encouraging hope and inspiration to youth interested in pursuing the arts? C: After our premiere at Hot Docs, we were overwhelmed by the support and interest for the film to be shown in other festivals, schools and communities. Hot Docs allowed us the platform to share Classic Roots’ story and positive message to a wider audience and raise awareness of our plans to take the film on tour to First Nations communities across Ontario. We are grateful to have received funding from Inspirit Foundation to help us make this a reality, with our tour expected to launch in late Spring this year. We are also planning to integrate the film into educational curriculums for Indigenous and non-Indigenous students, along with workshops from Classic Roots himself in schools. We have also partnered with We Matter, a national Indigenous-Ied multimedia campaign committed to youth empowerment and life promotion. We Matter will bring forth materials, workshops and resources that will directly focus on and encourage conversations on mental health, while cultivating relationships with youth on a mentorship level. Our mutual mission is to create an environment that inspires youth engagement through art and leadership in isolated and rural communities. Together we hope to make a difference for youth and their communities through our shared values to motivate, inspire and encourage youth of their abilities to create positive change in their communities. AWI: Why do you think art is so important for young people? C: To me, art has the ability to engage and reach people on an emotional level. It encourages expression, which can lead to connecting, learning, healing and transformation. I believe it’s important for young people to have access to the arts because it is an opportunity for them to not only learn about themselves, but the world around them. It can speak to them in ways that is not forceful or authoritative, but empowering and inspiring. Interested in learning more? Get in touch with Chrisann here, who is looking for partners to team up for film screenings and workshops with Indigenous and non-Indigenous communities, encouraging hope and inspiration to youth interested in pursuing the arts!